Enabling transit vehicles to make in-lane stops confers a broad range of operational and accessibility benefits, and can often be accomplished with little to no adverse impact on general traffic flow. Transit stops with in-lane boarding require significantly less curb length and do not occupy sidewalk space, freeing room for alternative uses, including expanded pedestrian capacity, green infrastructure, local business access and parking, or street furnishings. Cities determine preferred stop length based on available right-of-way, target speed, and agency experience. These charts reflect a range that exists across different US cities. Transit Stops & Stations: Stop Spacing, Location, and Infrastructure. San Francisco Municipal Transportation Agency, San Francisco (2015). Guidelines for the Design and Placement of Transit Stops. Washington Metropolitan Area Transit Authority, Washington, DC (2009). SEPTA Bus Stop Design Guidelines. Delaware Valley Regional Planning Commission, Philadelphia (2012). Transit vehicles make in-lane stops using boarding bulbs, boarding islands, median platforms, or curbside sidewalk stops. In-lane stops limit the curb length needed for efficient transit stops, preserving space for other curbside uses. Boarding bulbs and islands minimize interruption of the sidewalk, providing comfortable space for waiting riders, and shortening crossing distances. Stop platforms may serve a streetscape function as well, creating space for planters, bioswales, furniture, or bike parking. Ensure platform length provides adequate space for waiting passengers at high-volume stops and routes. Bulb and boarding island widths are usually constrained by available right-of-way to 6–10 feet, depending upon configuration, so additional rider capacity is dispersed along the bulb length. All-door boarding has also demonstrated effectiveness in distributing riders along platforms. At low transit volumes, in-lane stops have little effect on street operations but reduce transit delay. At high transit volumes, in-lane stops improve transit speed and provide room for more buses per block. Refer to the above table for preferred platform lengths with bus stops. Rail platform length will vary based on vehicle length, but should extend from the front door through the rear door. Locate platform with at least 10 feet of clear distance from crosswalk or curb return. Measure to transit stop pole at near-side, or rear of transit vehicle at far-side. While 5 feet is the minimum curb length for a receiving facility at each boarding door (ADA Std. §810.2.2), design platforms to be continuous through all doors, and consider additional elements to improve passenger comfort (see Station & Stop Elements). Provide 5–10 feet of distance between each additional transit vehicle expected to be dwelling at the platform consistently throughout the day. 5–10 feet between each queuing vehicle. Boyle, Daniel K. Better On-Street Bus Stops. TCRP Synthesis 117. Transportation Research Board, Washington, DC: 2015. Design boarding bulbs and islands to accommodate proper drainage and sweeping; tight radii may require maintenance agreements to ensure bulbs are properly cleaned and maintained. With pull-out stops, buses shift out of the travel lane to service stops. While they have operational benefits for transit compared to in-lane stops in certain situations, they often provide benefits chiefly for through-traffic, while slowing bus operations due to the need to shift in and out of travel lanes. Bus zones lengths at pull-out stops include transition or taper space in addition to platform length, resulting in a need for longer clear curb zones than with in-lane stops. Where buses make queue jump maneuvers, pull-out stops allow the bus to pull to the right of queued traffic and receive an advance green signal. Where local and rapid/limited services are provided on the same route or corridor, local service may pull-out to stop at preferred transfer locations, allowing the rapid service to pass the local, and stop in-lane. Pavement markings and NO PARKING: BUS STOP signs (MUTCD R7-107) must clearly delineate the edge of the stop zone to deter blockages. Provide 5–10 feet of distance between each additional transit vehicle dwelling at the platform to allow a bus. Locate stop zone with at least 10 feet of clear distance from crosswalk or curb return. Measure to transit stop pole at near-side, or rear of transit vehicle at far-side. Bus-mounted cameras can enforce vehicles blocking the stop zone. White diagonal hatch line markings may be striped to delineate the entry and exit tapers and discourage blocking. References for Platform Length: 5 found. Daniel K. Boyle. "Better On-Street Bus Stops." 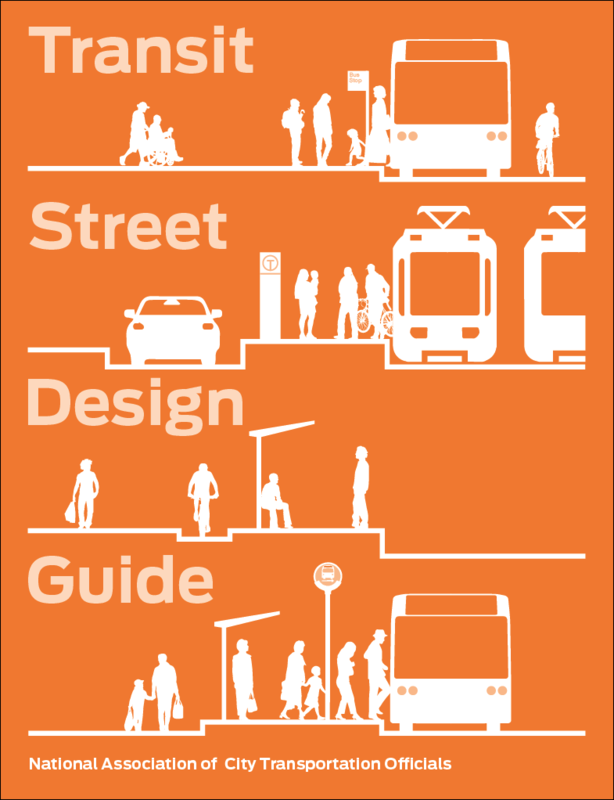 TCRP Synthesis 117, Transportation Research Board, Washington.
. "SEPTA Bus Stop Design Guidelines." Delaware Valley Regional Planning Commission, Philadelphia. Britt Tanner. "Transit Stops & Stations: Stop Spacing, Location, and Infrastructure." San Francisco Municipal Transportation Agency, San Francisco.